With black bin liner slung over a shoulder, rucksack attached to his back and Pompey carrier bag clutched in hand, Smith sought his exit. Unfortunately his progress stuttered, the striker struggling to locate a passage out of Victoria Park in a beautifully metaphorical moment. Yet while the 24-year-old represented a lost figure circumnavigating the ground long after the final whistle, the destination of the club he leaves behind is finally clear. It is Plymouth for Paul Cook’s side in the two-legged League Two play-offs. As for Smith, a key member of the team which achieved such an outcome, his footballing future remains clouded. Heavily out-of-favour at Swindon yet contracted for another 12 months, his next move is uncertain. Cook has been impressed with Smith’s contribution and already intimated there may be a follow-up come the summer. In response, the former Charlton man made all the right noises during the aftermath of Hartlepool over a potential reunion. By his own admission, it is have bags, will travel as he seeks a stable home for his football to flourish within. Yesterday there was no romantic farewell of a goal at the culmination of the tall frontman’s effective 93-day emergency loan. It was a swansong which lasted 73 minutes before making way for Conor Chaplin, the youngster then sealing a 2-0 success. Regardless, those faint automatic promotion hopes were not allowed to linger for another week, results elsewhere removing that scenario. And Smith’s time has also come to an end – his Fratton Park days over. For the colleagues left behind it is onwards to the play-offs. In truth, a return of four goals in 16 appearances did not match his glorious end product of last term in League One for Swindon. Yet from a concerning slow start, the hard-working Geordie began to change many opinions, proceeding to net three times in his final six appearances. 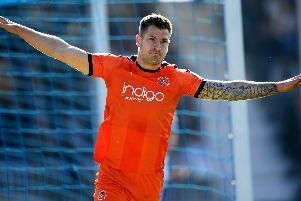 Smith was also part of a team which picked up nine victories from their last 14 matches to finish in the top six and demonstrate handy momentum into the play-offs. Unfortunately for the Blues, Accrington and Bristol Rovers in particular have enjoyed even more impressive season finales. In both instances following convincing defeat to Cook’s troops. Still, Pompey are assured of fifth or sixth spot, outcomes either way which guarantee Plymouth as their play-off opposition in a date still to be finalised. They eye that fixture without Smith, while Marc McNulty continues to struggle with a hamstring problem and Conor Wilkinson remains out of action to further deplete striking options. Chaplin is around, however, and upon his return from a groin problem sealed that victory over Pools on Saturday with typical finishing finesse. That’s 11 for the season from the teenager who has registered seven of them from the substitutes’ bench. Undoubtedly he will be a key figure during the welcome extension of the campaign. Yet it was the performances of two players who have spent times in the Pompey wilderness which really stood out in a typical end-of-season affair. Adam Barton, the midfielder Cook appears loathe to play in midfield, was supreme in a successive clean sheet. While Brian Murphy marked his first appearance in 21 Pompey matches with two excellent second-half stops to underpin the subsequent victory. With Adam Webster and Matt Clarke again sidelined through injury, Barton was once more entrusted to partner Christian Burgess in the centre of defence. The pair had achieved an impressive shut out against AFC Wimbledon in the week and maintained their effectiveness at Victoria Park. Encouragingly, Jack Whatmough made a 90th minute entrance for a first Blues appearance since damaging knee ligaments against Cheltenham in March 2015. However, the likelihood based on this form is Barton will keep his starting spot for the play-offs should there be no recovery from Webster or Clarke. Such is the depth of Cook’s goalkeeping injuries, there wasn’t even a stopper on the bench at Hartlepool, with Paul Jones, Ryan Fulton and Alex Bass all sidelined. Murphy is the last man standing – and proceeded to register an 11th clean sheet in 24 appearances for the club. In the second-half he thwarted Hartlepool in two superb one-on-one stops to emphasise what he offers Cook’s side. His excellent distribution once again also impressed throughout to fully justify his manager’s public backing in the build-up to the fixture. Pompey took the lead on 57 minutes when Smith’s shot deflected off Dan Jones into the path of Evans. The right midfielder’s cross was met with a smart backheel from close range delivered by Kal Naismith for his second Blues goal. Barely two minutes later and Murphy had come to the visitors’ rescue to block Billy Paynter’s attempt after put through. There was another scare on 69 minutes when substitute Rhys Oates’ first touch involved him bearing down on Pompey’s goal. Once more Murphy came off his line for a point-blank stop to retain their slender one-goal advantage. For a keeper whose presence continues to be questioned by the Fratton faithful, it is only right he is lauded for such moments of excellence. In the context of yesterday’s occasion, they were crucial stops in securing an 11th win of an extremely profitable away campaign. During that improved second-half, Smith and Gary Roberts both spurned great opportunities to put the game beyond the hosts’ reach before it was sealed on 85 minutes. Substitute Adam McGurk’s ball down the left was met with a cut-back from Enda Stevens and Chaplin applied a first-time left-foot finish with the minimum of fuss. The youngster continues to make scoring seem easy and a second-successive goal had contributed to another three points for Pompey. Fitting he should have the final say in a fixture which would see striking rival Smith depart the club. Elsewhere, Eastleigh’s failure to make the National League play-offs has intriguingly left Matt Tubbs no games to play in a loan spell. Still, Smith has played his part, his season is now over. But for Pompey, promotion remains an opportunity, a long-held ambition which must be achieved without him.